You know how much I love France’s Loire Valley. And the Cabernet Francs that come from this region. Chinon is a part of the Loire well-known for these red wines. 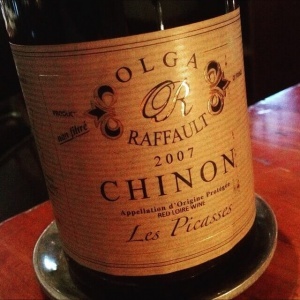 I had the Olga Raffault, a winery whose Chinons seem to flood my Instagram and Delectable feeds, at Hearth in New York’s East Village. It was $68 on the list. An insane bargain! A quick spin on WineSearcher shows the 2007 retailing for around $26, which is gonzo-crazy. For an 8-year-old wine, the Raffault was extremely youthful. Very fresh. And quite rich, too. But not hefty. Wonderful savory elements compelled me to an ongoing astonishment each time the glass was picked up and put down. I secretly worried something “meh” about this Chinon would materialize (R-E-L-A-X, dude) but it never did. I love those wines… They are such a great value. I was once someone’s guest at Nomad where we drank the 2001 and it was around $70! I keep having to do double-takes when I look at the price. Will enjoy it while it lasts! Aw, a sweet New York love story!! I have walked by that restaurant – was the food as good as the wine? I love New York so much. Tip of the iceberg! I actually prefer eating at the wine bar 50 Paces, which is (wait for it…) 50 paces away and related to the restaurant. Much more casual and cozy. The sausage dish at Hearth was outstanding. BOOKMARKING THIS!! If someone like you says it’s the best red they’ve had in years, I definitely need to pick up a bottle! Such a pleasure meeting you last week!! Thank you for checking out my blog. 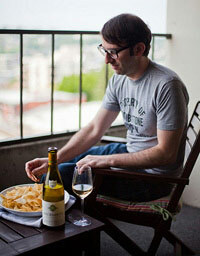 I bet Domaine LA or Silverlake Wine could track it down. Hope to see you in LA and such a pleasure to meet you as well. I had the ’06 with roast duck for Christmas dinner. Stunning! I’m going to find more. Sounds like an excellent match! I see older vintages all over New York restaurants and wine shops.